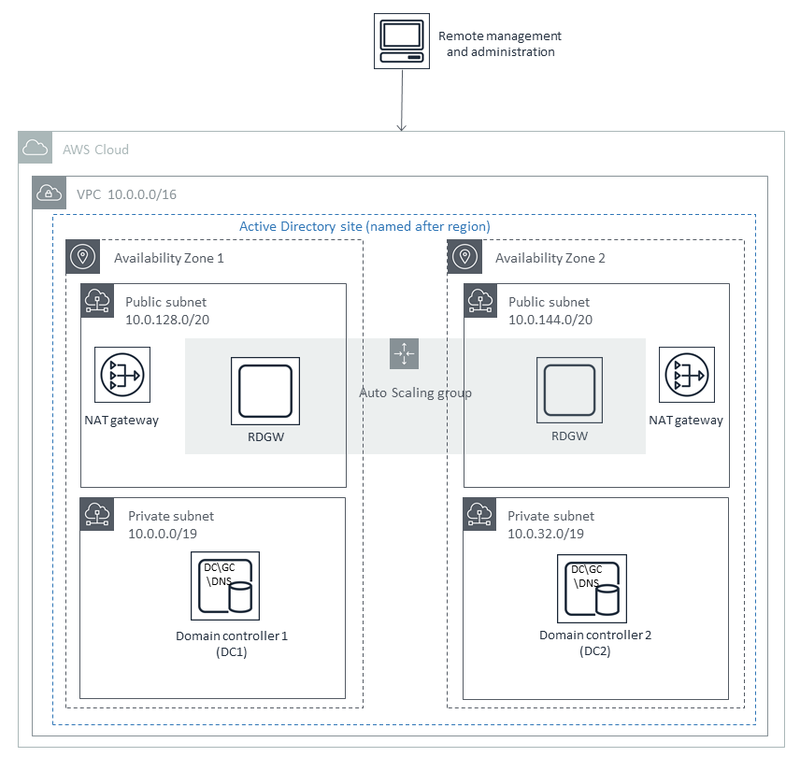 For each scenario, you also have the option to create a new virtual private cloud (VPC) or use your existing VPC infrastructure. AWS Systems Manager Automation documents to set up and configure AD DS and AD-integrated DNS. AWS Secrets Manager password storage. Windows Server forest and domain functional level. Security groups and rules for traffic between instances. For new AD DS installations, the Quick Start also deploys AD DS and AD-integrated DNS, and sets up Active Directory sites and subnets. 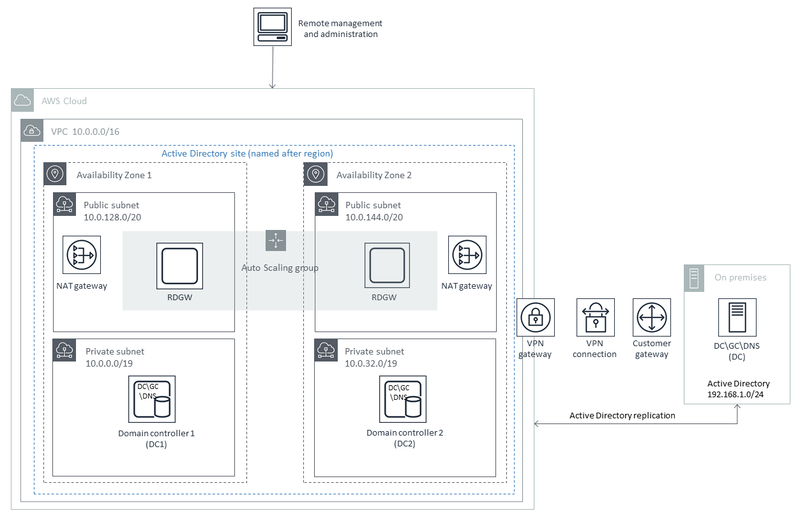 AWS Directory Service to provision and manage AD DS in the private subnets. 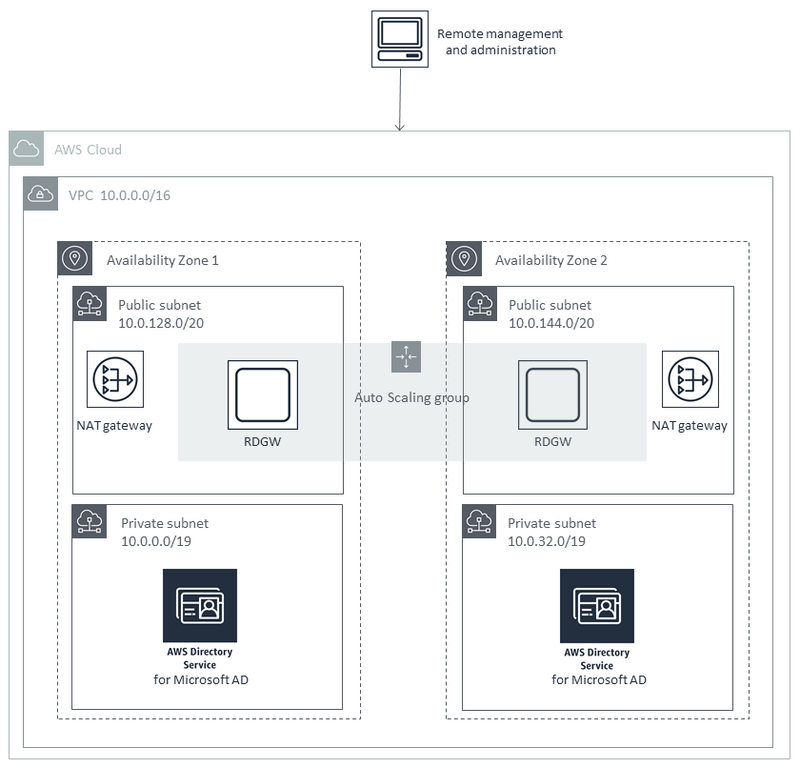 If you're extending your on-premises AD DS to the cloud, complete a few connection and configuration tasks to ensure that your hybrid environment works properly. Customization options include CIDR block sizes, Remote Desktop Gateway and domain controller instance types and IP addresses, and Active Directory configuration. The AWS CloudFormation template for this Quick Start includes configuration parameters that you can customize. Some of these settings, such as instance type, will affect the cost of deployment. For cost estimates, see the pricing pages for each AWS service you will be using. Prices are subject to change. This Quick Start launches the Amazon Machine Image (AMI) for Microsoft Windows Server 2016 and includes the license for the Windows Server operating system. The AMI is updated on a regular basis with the latest service pack for the operating system, so you don’t have to install any updates. The Windows Server AMI doesn’t require Client Access Licenses (CALs) and includes two Microsoft Remote Desktop Services licenses. For details, see Microsoft Licensing on AWS.